The exploration of culinary culture is one of the most effective ways to awaken the uninitiated to both the complexities of other societies and the possibilities for fruitful interaction with them. What do most Americans know of Aleppo, a settlement founded several millennia BCE and continuously inhabited ever since? Not nearly enough. Also known as Halab, Halep, Alep… the city lies in what is now northern Syria. Jews, Muslims, and Christians have long mingled in what was a provincial capital of the Ottoman Empire. Until recently, in this polyglot and multi-ethnic city, a cultural rival of Damascus, one could find residents representing most of the faiths and ethnic groups of the Near East and eastern Mediterranean. Surrounded by pasturage supporting flocks and agricultural land yielding nuts, wheat, and olives, the city was a stop for the caravans bringing silk and spices from farther east. Given the ingredients at hand, it is no surprise that the inhabitants of Aleppo expressed themselves as much in the kitchen as they did in the city’s esteemed metal, glass, and textile workshops. Aleppo, with its population of Arabs, Turks, Kurds, Armenians, Greeks and other Europeans has long been renowned for the variety and sophistication of its food. Through their research and documentation of the rich social, spiritual, and gastronomic textures of Aleppo’s Sephardic community, Poopa Dweck and Michael J. Cohen have succeeded admirably in presenting and preserving a culture through food. 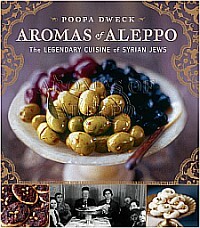 Sadly, most of Aleppo’s specifically Jewish dishes are now to be found only in the diaspora of Aleppian Jewery. Middle Eastern political tensions over the past 60 years have caused virtually the entire community of Syrian Jews to emigrate. Aleppian Jews are scattered from London to Latin America. In the US, where large communities reside in Brooklyn, NY and New Jersey, they, like immigrants before them, live amidst other ethnic and religious groups, and use food to maintain their distinct identity. And what food! While one cannot claim that a Druse, Armenian, Turkish Sufi, or Maronite Christian would never serve roast chicken with lamb-stuffed eggplant or that only a Jew would make a bulgur and walnut salad with tamarind extract, the ingredients and techniques of such dishes drop big hints and speak volumes about communal identity. And that’s most evident in the recipes reflecting kashrut, Jewish dietary law, to which the Aleppian community is strictly adherent. Thus, the rice dishes rich with sheep’s milk butter won’t be prepared by observant Jews if they are serving their pilaf with meat; Aleppian Jews would make theirs with vegetable oil. There’s a wealth of general Middle Eastern culinary information here: well-photographed and detailed instructions for making string cheese with nigella seeds and recipes for candied eggplants with cloves, pistachio-studded Turkish delight, and sesame halvah. In both Syria and the US, most Aleppians would never make these things at home, but would buy them from specialty shops. Apparently the authors are leaving nothing to chance: they’ve seen their parents’ generation leave home, and that’s enough to make them meticulously list and document what the immigrants managed to bring with them. Some dishes, like sliha, a concoction of wheatberries with pomegranate seeds, nuts, and coconut served to celebrate a baby’s first tooth, are occasion-specific. Arcane, but easily made, it’s safe to say that sliha is probably something that would be lost were it not for the efforts of the authors. The production values of this hefty tome are exceptional. With its lush graphics, fascinating archival photos, and luxurious contemporary food styling, the book is—in a word—gorgeous. For many, the very idea of Syrian Jewish food may seem recherché, but the recipes, simple and clearly written, yield extraordinary results. Syrian or not, Jew or gentile, for anyone who seeks to learn more about the Middle East and its culinary legacy, this would be a wonderful present. Through what has clearly been a labor of love, Poopa Dweck and Michael Cohen have created something of permanent value, not only to their community, but to anyone who knows—or wants to learn—the power of sharing food. And if our world ever needed that power, it needs it now. With the fragrances of garlic, mint, lemon, saffron, allspice, and rose water—Aromas of Aleppo could literally bring a lot of people to their senses.